'Idle Mind' is the debut album of Anna-Mieke Bishop, songwriter and multi-instrumentalist from Wicklow, Ireland. Recorded in the far-reaches of west Cork, as well as in Pickering Forest, Kildare, Anna-Mieke accompanies herself on Greek bouzouki, electric guitar and piano, adding cello accompaniment to several tracks in studio. Joining her on this record is long-time collaborator Brían Mac Gloinn (of folk duo Ye Vagabonds) on Indian harmonium, fiddle, additional strings and vocals, and Matthew Jacobson (of contemporary jazz ensemble ReDiviDeR and experimental folk group Clang Sayne) on percussion, adding to the eclectic assortment of sounds that make up Idle Mind. Rooted in folk, the ten tracks on the record philosophise through abstract lyrics about place, age, belonging and various societal misalignments. "The voice lies at the heart of what it is to be human so just right now, as our lives become a little more virtual, augmented and artificial, Anna Mieke's songs with their infinity of interlaced traditions and her voice with its alluring melody of intimacy is a wonderful and very welcome gift"
'Idle Mind' is set for independent release on 26th April 2019 on 12" vinyl, CD and digital. Anna Mieke is the musical project of Anna-Mieke Bishop, in which musical landscapes are weaved into song on Greek bouzouki, guitar and piano (and cello, in recordings). As a solo performer and collaborative artist, she has joined forces with a diverse mélange of other artists, most notably Brían Mac Gloinn (of folk duo Ye Vagabonds), who, as well as playing on all of the above, adds drones on Indian harmonium and fiddle accompaniment. Another, more recent, collaborator is Matthew Jacobson (of contemporary jazz ensemble Insufficient Funs) adding a flare on percussion. Themes and inspiration for Anna Mieke's songs stem from a colourful background of experience: learning Maori songs at school in New Zealand and sean-nós songs off the coast of Ireland; hitch-hiking through Hungary, Romania and Bulgaria, picking up traditional songs along the way; cycling from her home in Wicklow to the southern tip of Spain; living in Granada for a while, and then, in Cork, performing cello in the experimental improv group, HEX. Anna Mieke has shared the stage with many established artists, supporting the likes of Lisa Hannigan, Martin Hayes, This Is The Kit, Rozi Plain, Lankum, Gyda Valtysdottir (mum), Rachel Sermanni, Sarah Neufeld (Arcade Fire), and Ye Vagabonds, while sharing the stage with David Kitt, Landless and Rosie Carney. From performing in larger venues such as the National Concert Hall and to opening the inaugural RTE Radio Folk Awards in Vicar Street, to underground caves, to manor house ballrooms, to tiny cafés and bookshops, to the precarious ruins of a church, to forest hideaways in the hills of France, Anna Mieke has shared her songs in a curious combination of spaces. 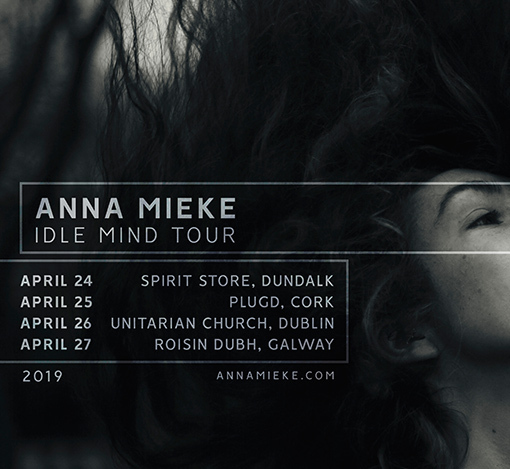 Following on from the release of two singles, Arbour and Keep It Whole in 2018, Anna-Mieke will independently release her debut album Idle Mind in April 2019.